As many of you might know, I don't like doing multiples, but since I only needed a dozen; it didn't seem like an impossible task. The Dandelion Designs scene in a circle was an easy choice because it was appropriate for a calendar and quick to color. I really wanted to use one of the Japanese girl stamps too, but since the favors would be given to a mixed group different ages and sexes, I wanted it to be neutral. I chose to use three different sets of Memento pens instead of my Copic. I found that I really liked the two tips on the pens, a flexible but sturdy brush tip and a ballpoint. With these pens I was able to easily color the very tiny areas and get a mottled look on the sky and grass without changing pens. A 2" Marvy circle punch will cut perfectly around the DD stamped design, making the assembly super easy. I used both 2-1/4 x 3-1/4 magnetic photo frames and the same sized stand up frames because I didn't have 12 of one style :( . 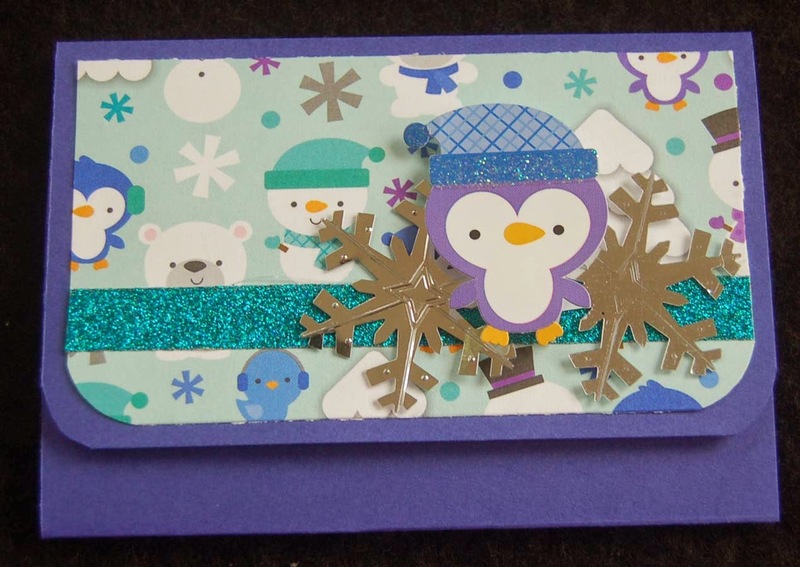 The foil fan stickers were added to add a bit of texture and sparkle. I think the Japanese character means 'longevity' or 'success'...hopefully it doesn't say 'sympathy'. 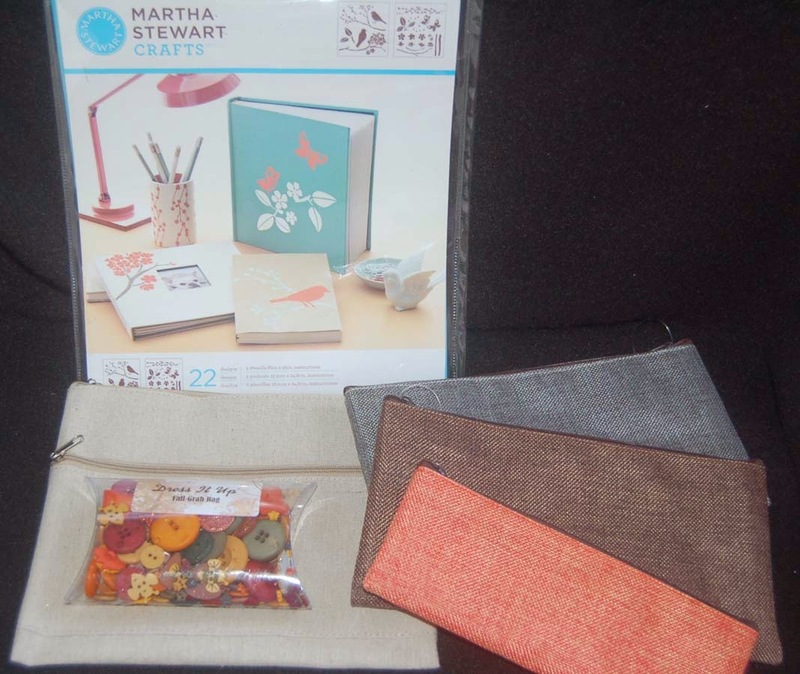 Everything used on this project was purchased at HM Ben Franklin Crafts except for the calendars which were ordered online from Vippies and the background bamboo washi paper which came from Japan but I think you can find something similar at Celebrations. I plan to use a piece of ribbon to hang each calendar from a wrapped bottle of hand soap for presentation on the party dining table. 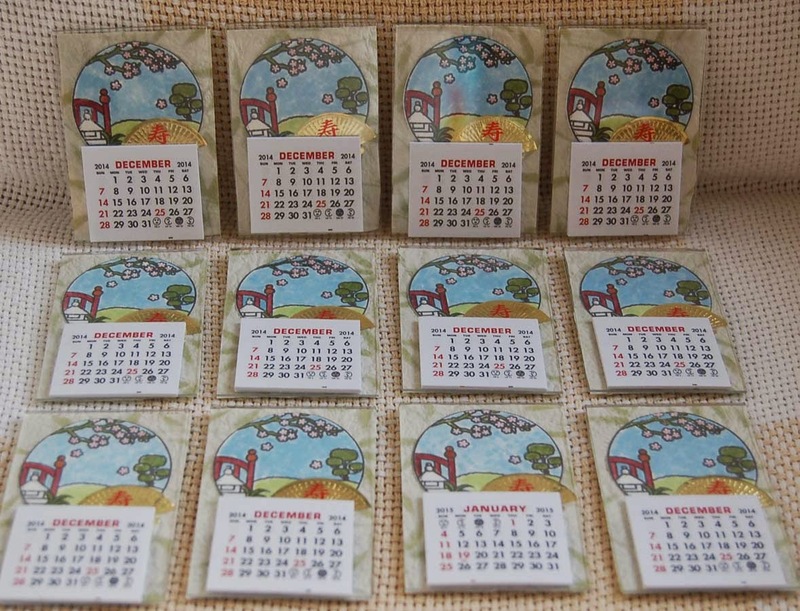 The party guests will get to use the soap and still have a calendar to use for the rest of the year. Happy New Year to all my blogland friends! Here it is....my last Xmas card of the 2014 season! As many of you know, I love the vintage look ('cuz I am vintage!) 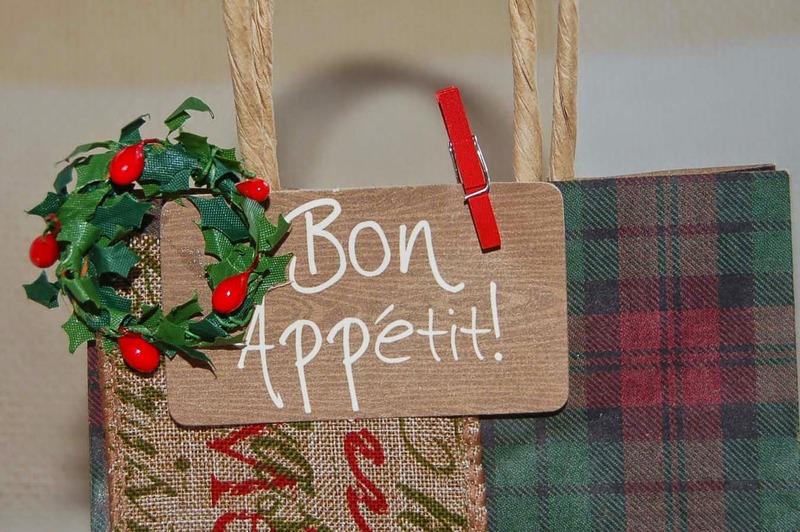 and always make at least one shabby chic type card for the various holidays. This year I wanted to incorporate the visual feel of the simple, cheap toy that I played with (see explanation in previous post) as a child. 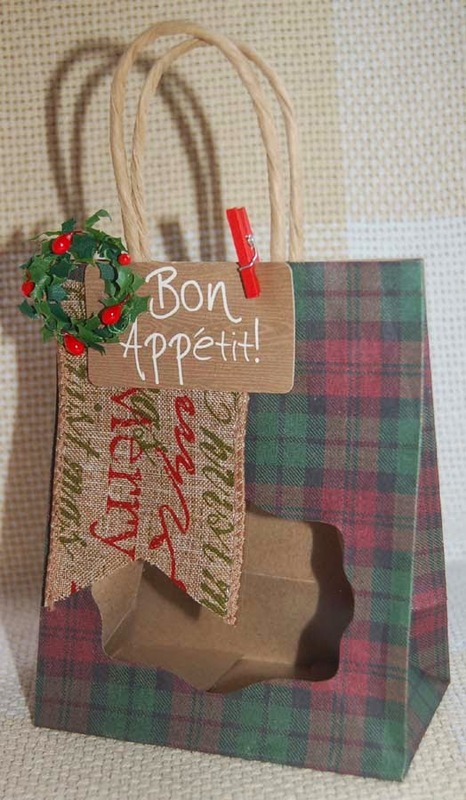 I really also wanted to include the rustic printed burlap ribbon (because there was so much yardage on the roll) from Ben Franklin Crafts and then I found the tartan embossing folder (Xcut) at BFC too! Doesn't it match well?....and it is usable for many occasions. The embossing was done right on top of the 5"square (Paper Accents) card so it shows up even inside the card...nice touch! From my messy craft table I rescued some paper scraps and a punched snowflake border(sparkled up with Wink of Stella) which added just the right color to brighten up the card. A strip of Little B washi skinny foil striped tape gave a bit more sparkle and color. Finally I wanted to add a Hero Arts poinsettia but it was a bit bigger than I wanted so I trimmed it. I also cut out my own leaves and distress inked the edges to look more vintage. I guess you can say I'm a paper gardener....LOL! Oh, I almost forgot to mention that I mounted the beaded panel on a rectangle of silver glitter card stock. 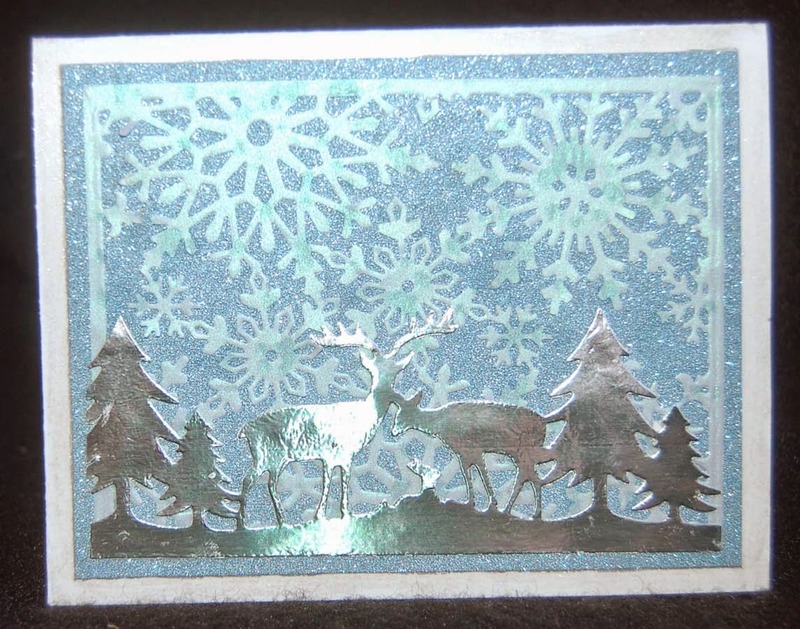 The thing that I remember about the vintage Xmas decorations and cards of my youth was that the images were detailed, die cut, and had lots of shiny stuff. We often used hand printed brown super market bags to wrap our gifts. 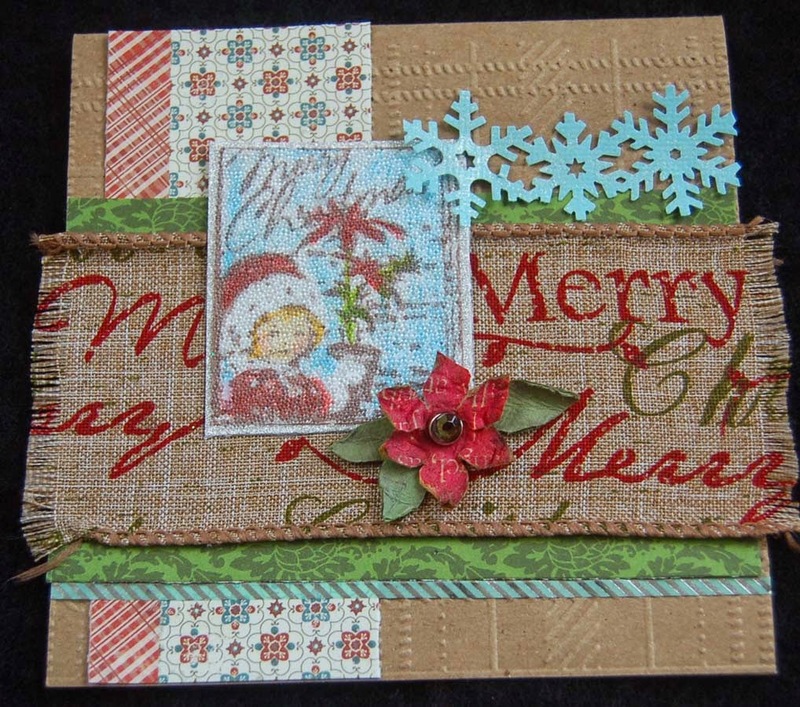 I still love that rustic look and it gives me a warm, fuzzy feeling to see that someone has taken the time to create a card or gift wrap with obvious love. Happy Holiday Hugs to everyone in blogland! In blogland this year I've seen lots of shaker ornaments made from one half of a plastic two-part ball. HM Ben Franklin Crafts have an ample supply of these plastic balls in three sizes so I just had to make some before the Christmas season ends. They were really easy to construct once I figured out what size scallop paper punch to use and that a hot glue gun does not work as well as 3 in 1 Beacon glue. First I stamped the images on pen marker card stock and colored them with Copic pens. The heart was hand-drawn because I didn't have the right sized heart punch or die. 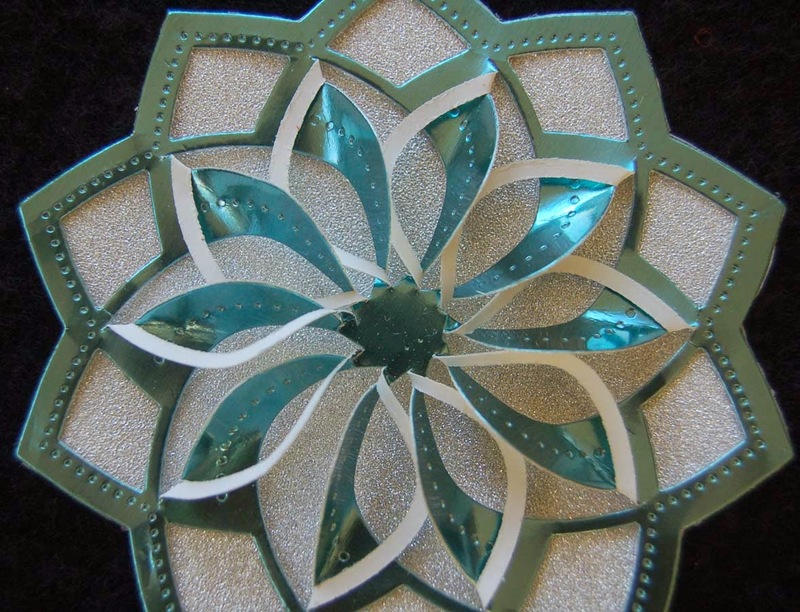 The cut pieces were adhered to the punched circle with pop-up glue dots. 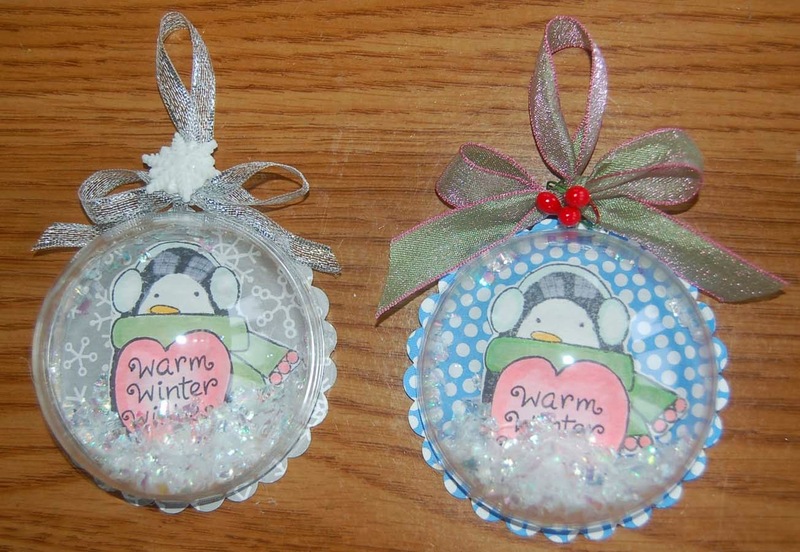 Next the bottom half of the globe was glued down and the snow glitter (MS or Darice) added before gluing the top half. 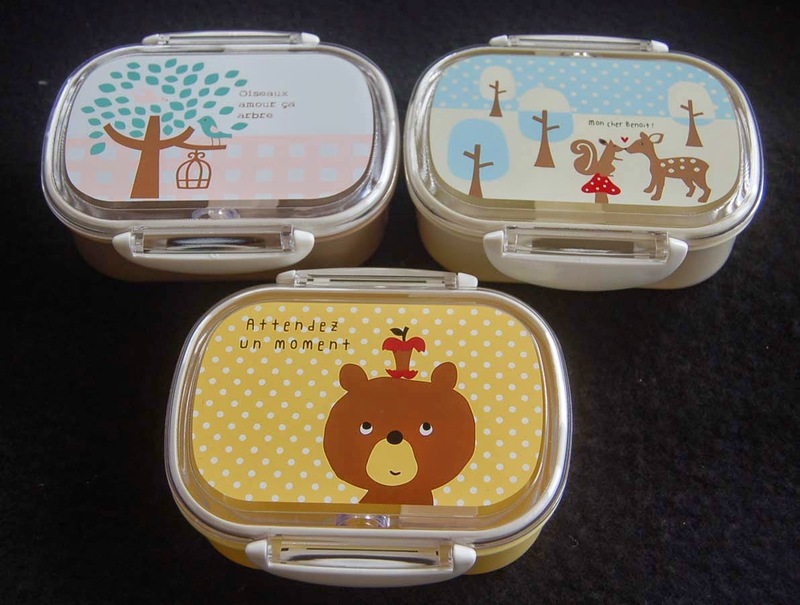 The fox image and sentiment are from a Lawn Fawn set and the penguin is a G Studio product. 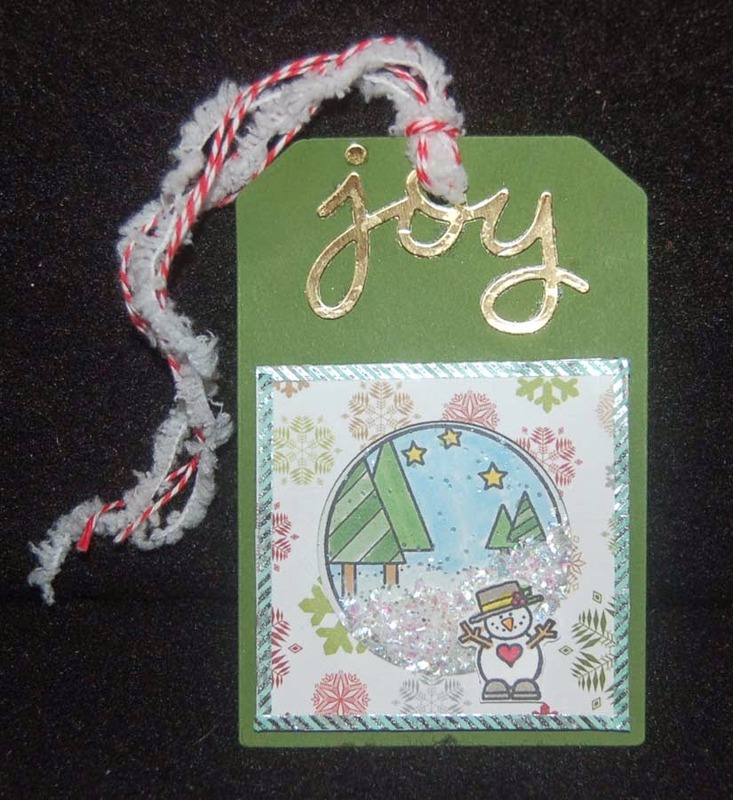 Ribbon and a few trims from BFC were added to finish off the ornament which also makes a great gift tag with space on the back for a message. I'm done with Christmas wrapping for this year but I am saving these for next year (comes around so fast, yeah?) and will probably make a few more before packing away my supplies. Okay, let's all start holiday crafting earlier next year...promise? One day while moving around my Martha Stewart vials of glitters and beads, I had a light bulb moment! I think this is a new idea, but some other crafter has probably used this technique before. I wanted the finished beaded panel to have the look of the little flicker (I think that was the name) plastic cards we played with in the OLD days. The flicker cards were images under corrugated plastic which changed from one picture to another when you moved the card. While my beaded panels don't have changing pictures, they do have a weird iridescence that I love. 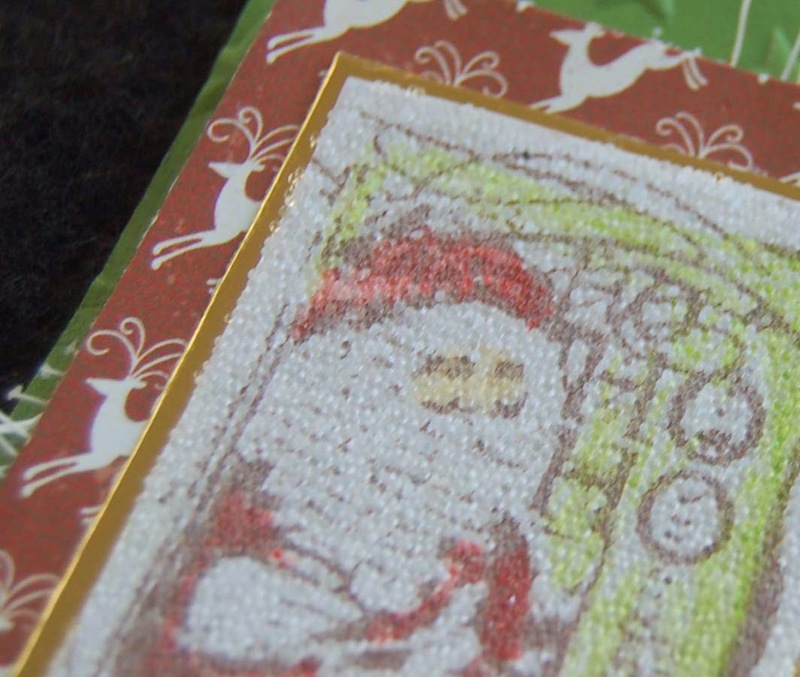 To make this panel I stamped the Recollections Santa image in dark brown ink on white card stock and then colored it with color pencils. Next I ran the panel image side down into a Xyron machine with a permanent adhesive cartridge. After peeling off the backing I poured on some Martha Stewart clear micro beads (purchased in a set from Ben Franklin Crafts). If you work in a little box you will be able to keep your work surface neater. 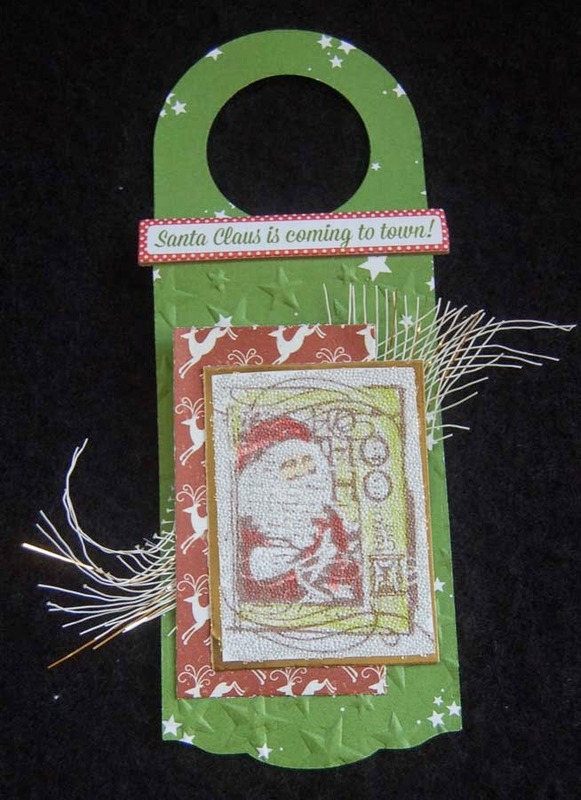 The tag base was cut with a wine bottle label die and embossed with a star embossing folder (Xcut) from Ben Franklin Crafts. A scrap of white mesh ribbon (wedding dept. 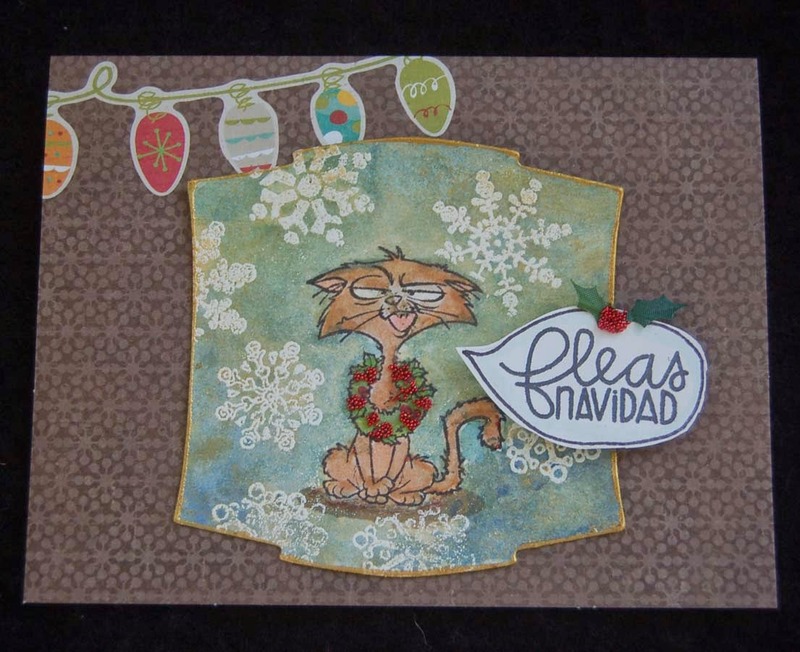 of BFC) added some textural interest (looks like whiskers) and some scrap reindeer card stock contributed more color. Because I thought that this tag might not be used as a wine bottle tag, I added the chip board words (Echo Park) so that the recipient might use this tag as a door knob/handle decoration. 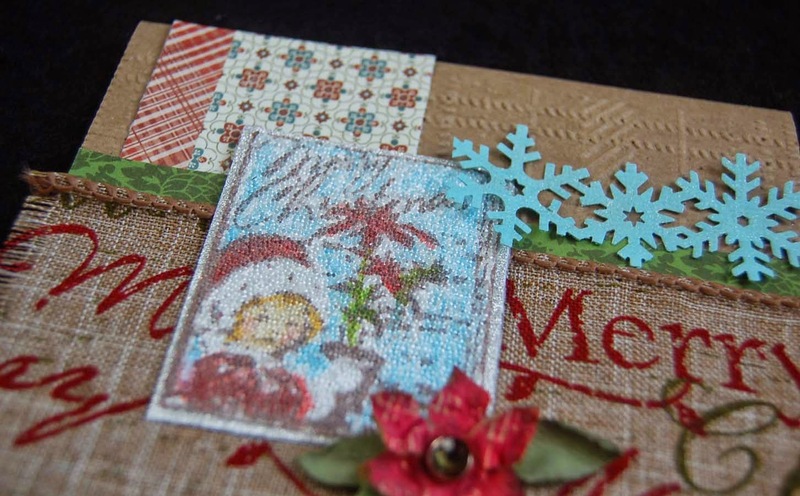 I used this same beaded technique to make a panel for a vintage Xmas card which will be featured on my next post. Hope you will visit this blog again to see it! 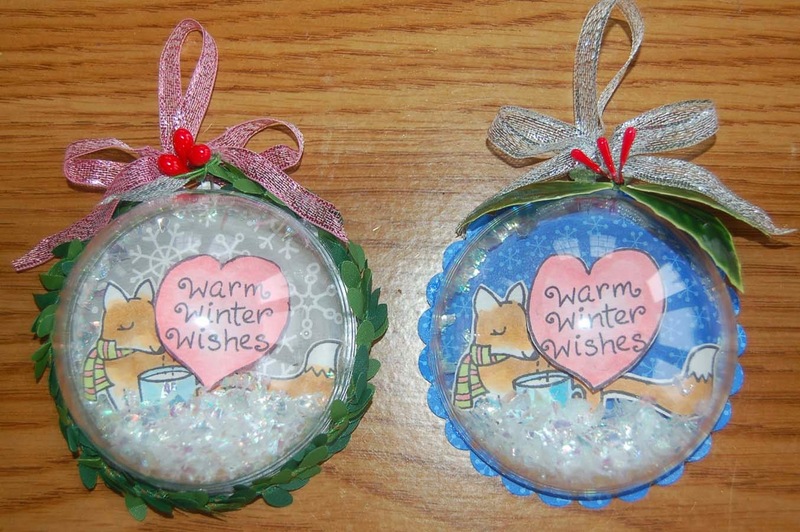 Don't these ornament/tags look extremely time-consuming to make? Surprise, because of the Spellbinders die that I purchased from HM Ben Franklin Crafts, I was able to whip these up in minutes. 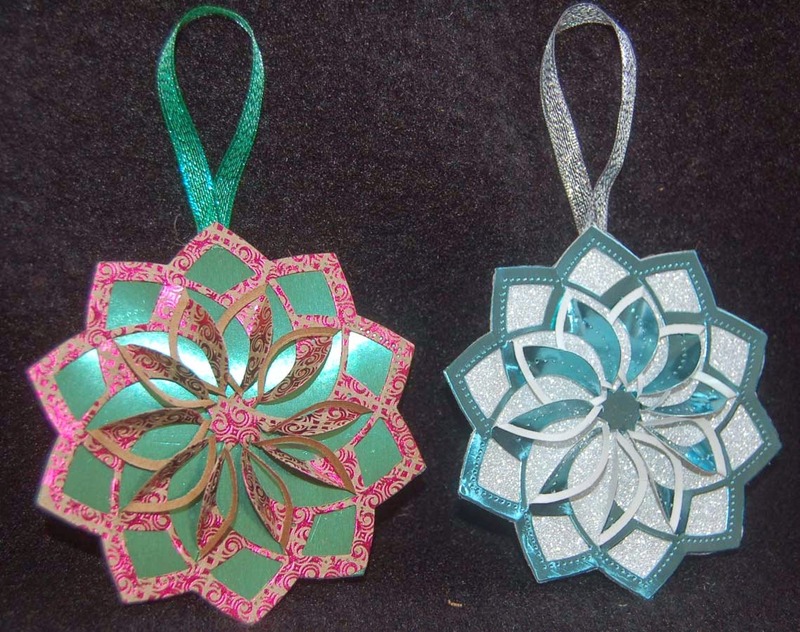 It's super easy to make them festive if you use cardstock with glitter and/foil (the DCWV 6x6 pads are perfect for these ornaments. 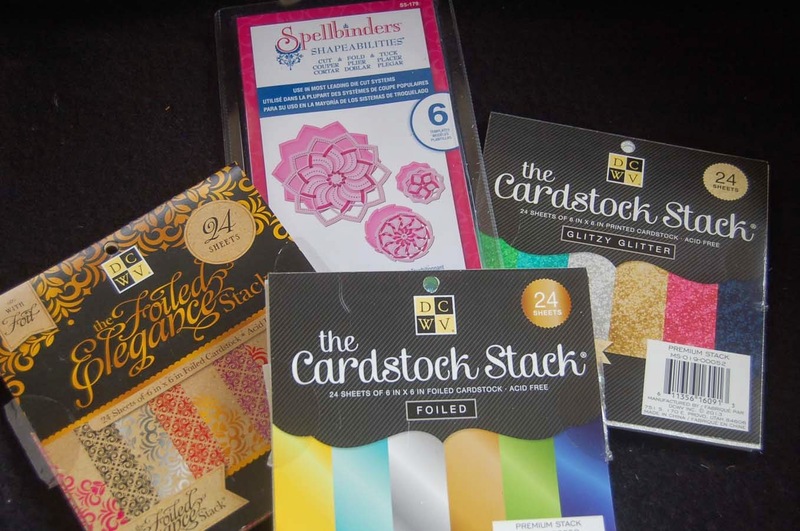 I would recommend using the glitter cardstock for the backing only because it is a tougher cardstock which makes the intricate cuts difficult. I like the plain foil in the front because the little impressed dots show up well. Somehow the blue ornament looks smaller than the red and green one....perhaps because I was trying to angle the photo to avoid a glare....they are really exactly the same size. 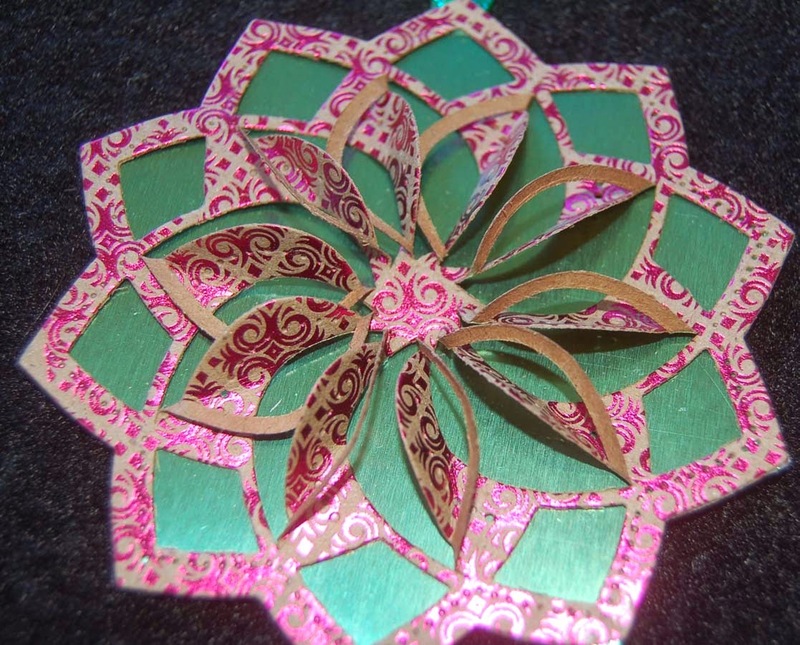 I chose to make the largest pinwheel-like star in the die set because there is room on the back to write a message. I put just a drop of 3 in 1 Beacon glue at the tip of each point to fasten the two parts and attach the ribbon hanger. I really, really love this pop-up die cut because it can be sent flat and the recipient can fluff it up .....better than a bow...it's a bow and tag in one! Although I am finished wrapping gifts for this year, I'm going to make a batch of these for next year (great to have some things done early) and hang some on my tree for this year. Oh, I just thought of something neat....these would make great fancy Christmas cards.....wonder how they would look with printed glitter or flocked cardstock.....gotta go and try this idea out! See ya later! Bumper Crop = Jam Time! Funny Story: Years ago my son gave us a starfruit tree for a Xmas gift, but sadly it never produced a single fruit in over 7 years. In frustration we decided to chop it down and buy a new tree, but first we went to the garden shop and asked a few questions. We were told that all we needed to do was add a little lime to the soil. Like a miracle this year we had an abundance of starfruit! 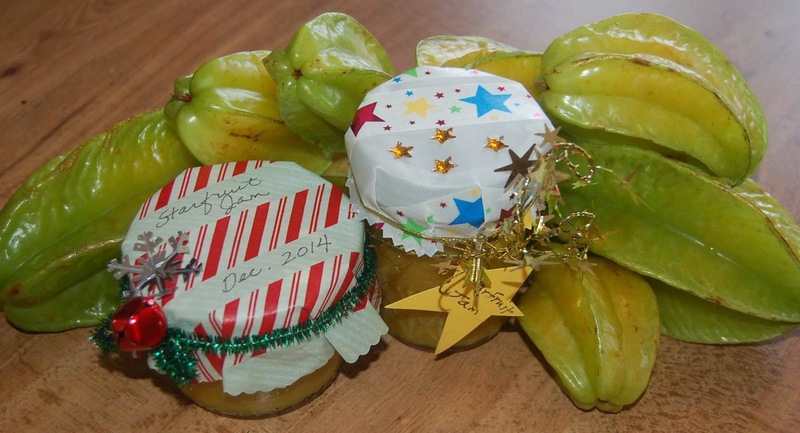 Of course we couldn't give away or eat all the fruit so I turned this bumper crop into jam and li hing mui! The crafter in me had to jazz up the jam jars with pretty paper toppers. I applied some Little B washi tape to vellum paper (thinner paper works better) and cut them into rounds with scalloped or pinking (zigzag) shears. Next I fastened the paper toppers with either pipe cleaners, gold elastic, or wire star garlands. To the star jar (clever huh...matches the starfruit) I added a star label (cut with a Sizzix die). For the candy cane jar I attached a jingle bell (sounds like Xmas! 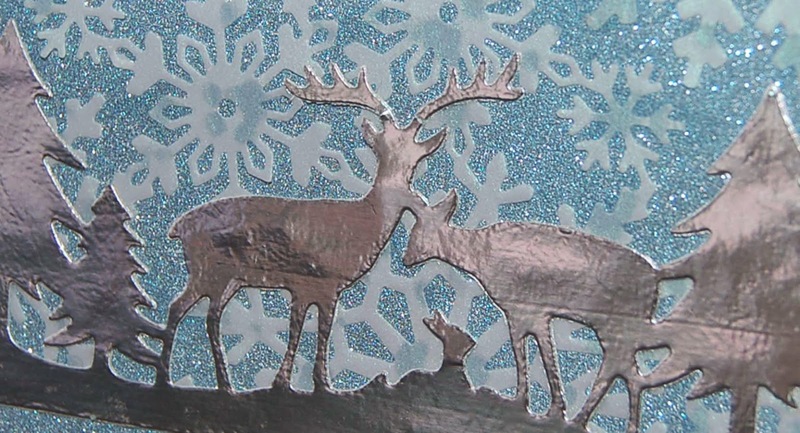 ), glued on a silver snowflake and wrote directly on the topper. 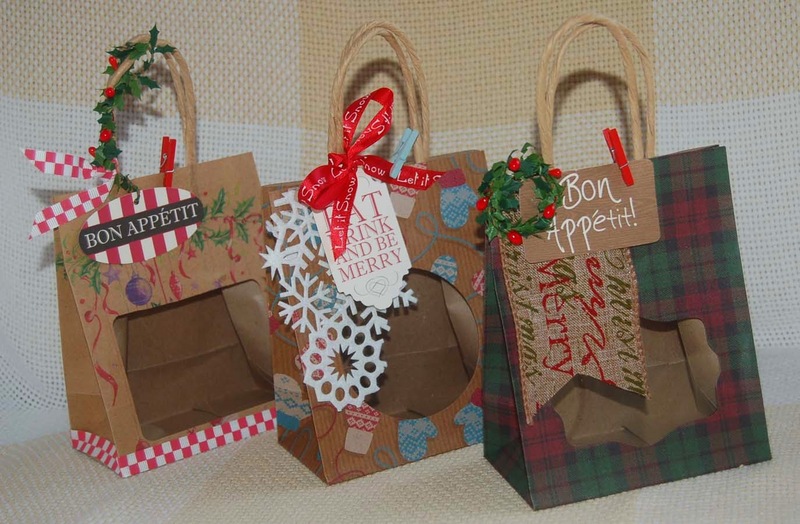 All of this takes just a few minutes but really adds to the holiday feel of a simple homemade gift. 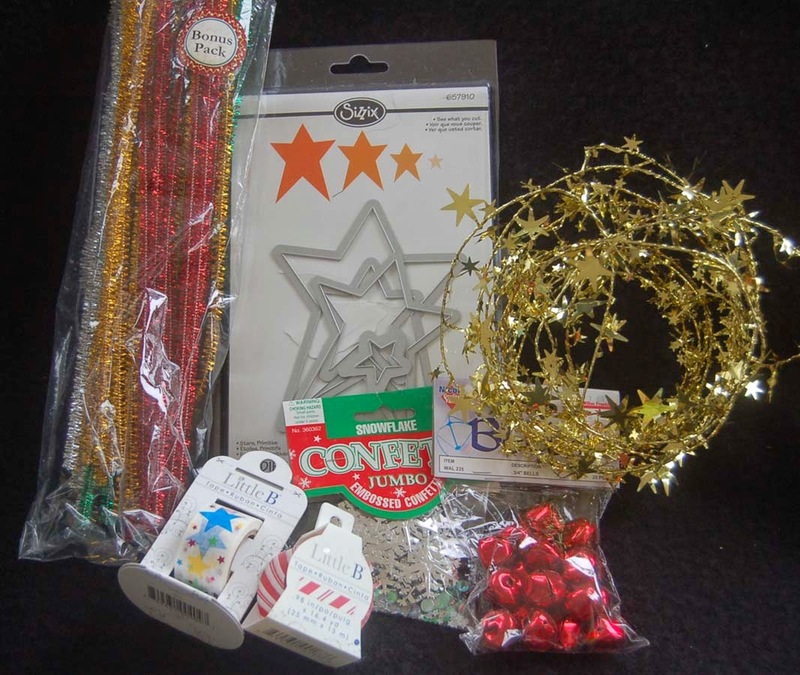 Of course these decorating craft items came from HM Ben Franklin Crafts where you can find so many things that will help turn your Christmas gifts into something special. The card blank with printed front and back came from the 'Snow Day' American Crafts boxed set of 40 cards. The background for the image was achieved with a Copic cool shadow pen and a sprinkling of Stampendous blue and white Fran-tage from BFC. 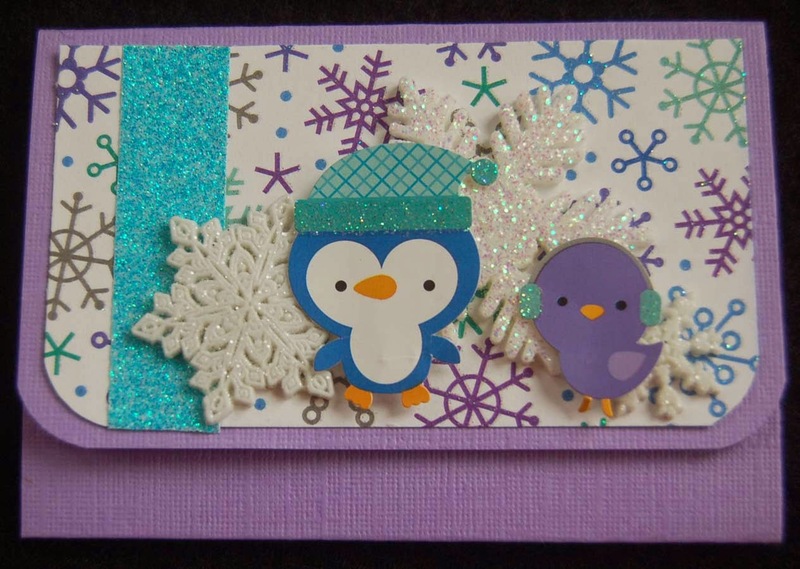 (Hint: Apply a little stick glue to keep the powder from blowing around when heat embossing the Fran-tage.) The iridescent (not visible in photo) white snowflakes are from a BFC miniature garland and the mistletoe berries are made with Doodlebug sticker pearls. 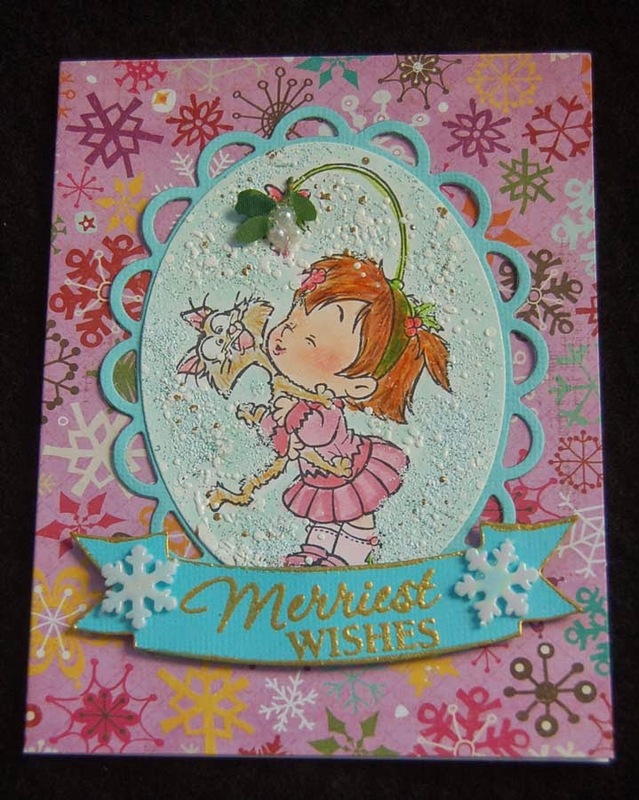 I am pleased with this card and plan to use the image on other non-holiday cards by masking off the mistletoe part. I think it will make a delightful Valentine's Day card. I love baking cookies and packaging them attractively for gift giving. I'm always scouring the shelves at HM Ben Franklin Crafts for cute Xmas bags or boxes. This year I found an economical set of 8 handled bags that were just the right size for amount of cookies I am giving to friends. 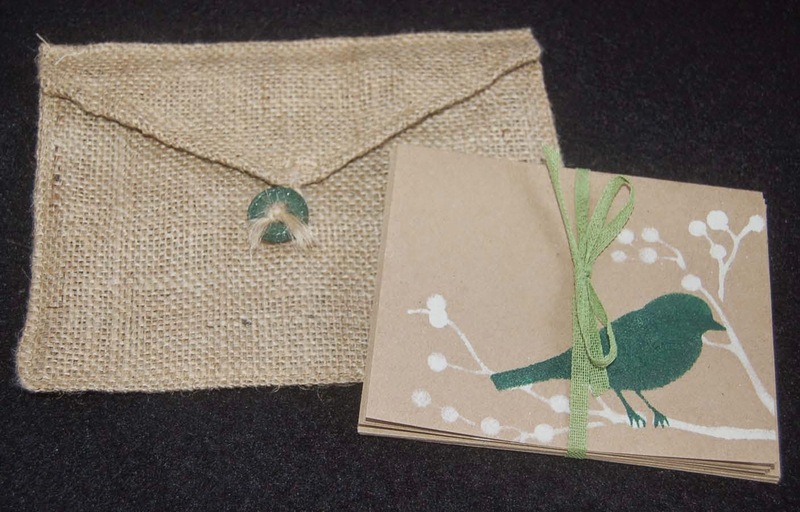 The bags were rather plain but attractive because of their rustic look. There are lots of thin dies that you can find at BFC to cut the windows. 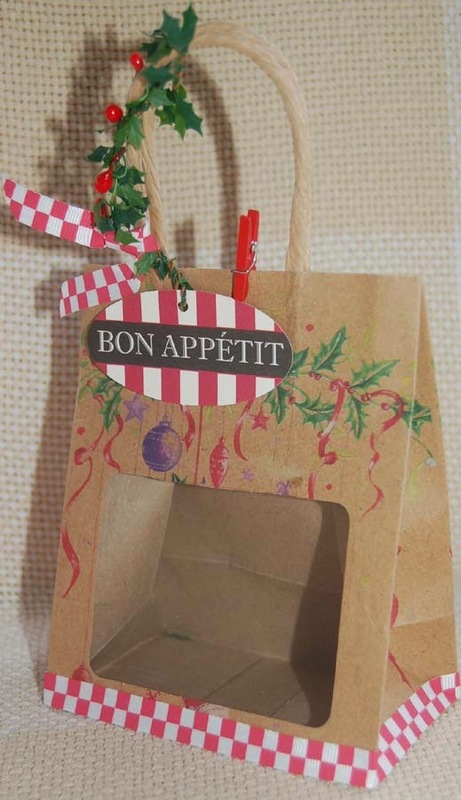 You will need to insert a small cutting platform into the bag and probably add a few shims to cut out the desired shape. After die cutting, I backed the windows with clear acetate and adhered it with double stick Merikan/Heiko tape. 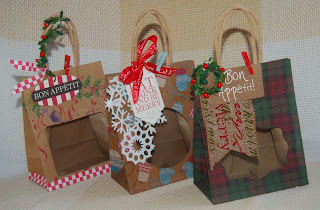 The most fun part for me is adding the embellishments to the bags. 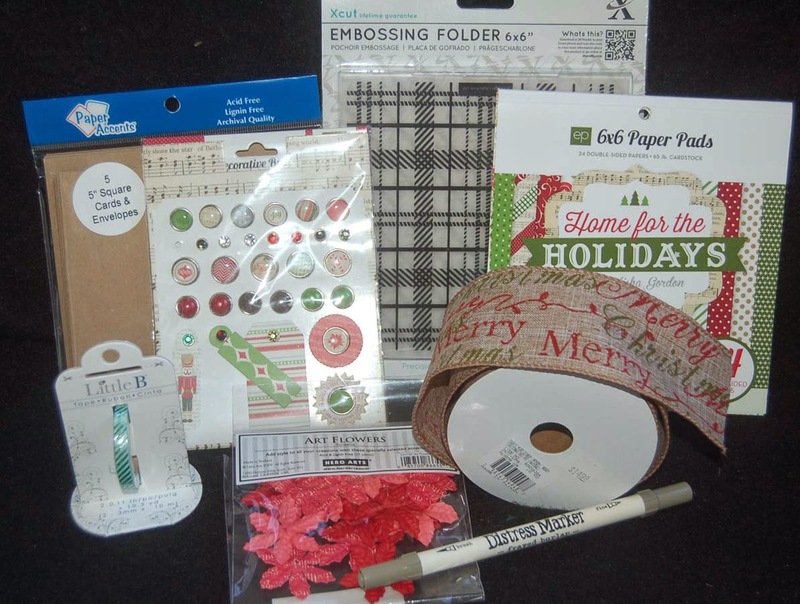 I found Martha Stewart felt snowflake ribbon, checkered American Craft ribbon and 'Let It Snow' Darice ribbon in my stash. 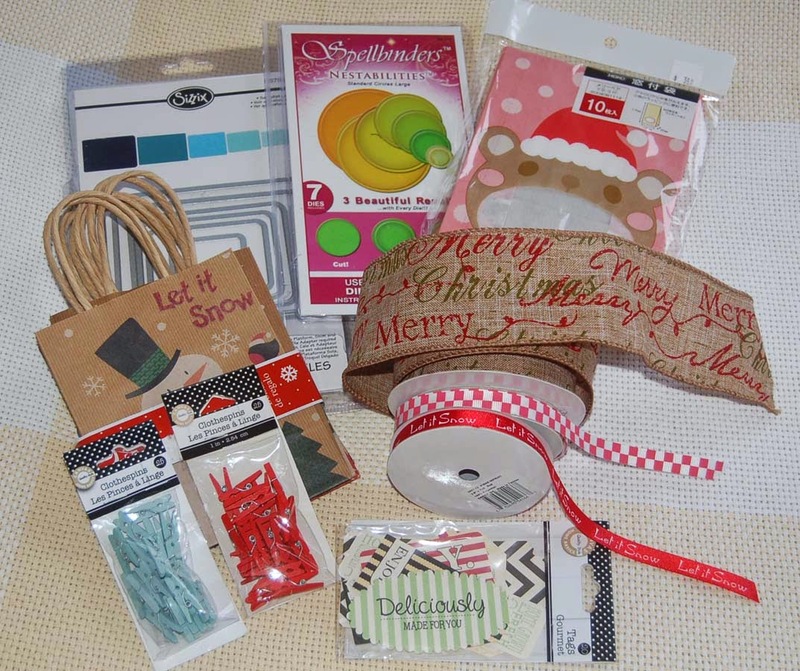 I know that you can find lots of decorations in your collection of Xmas stuff because all crafters are hoarders too. 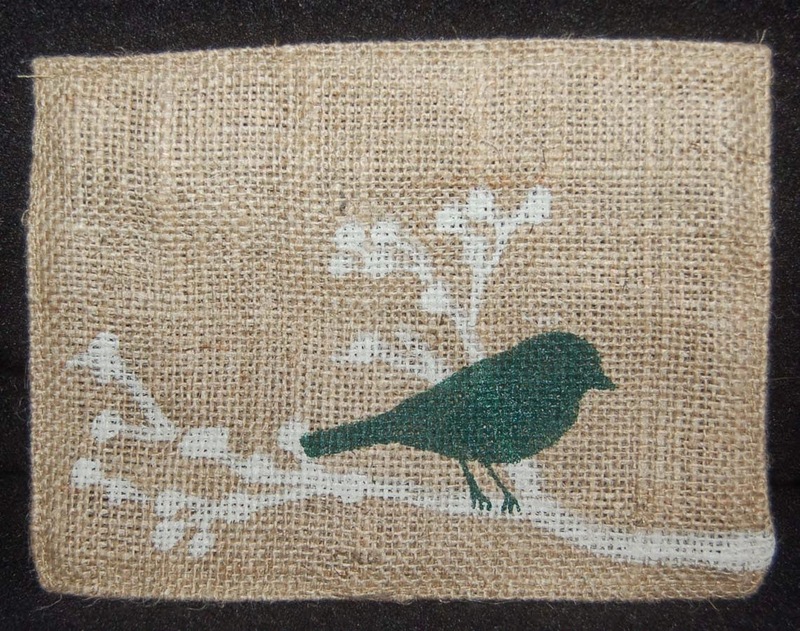 The new ribbon that I purchased this year from Ben Franklin Crafts is the printed burlap wide ribbon. I love it and plan to use it on many projects this year and for years to come *wink* (lots of yardage). For a closure to the bags, I clipped on tiny clothes pins (Canvas Home Basics) which I feel are the perfect finishing touch. The holly garland with pips were also in my collection of Xmas trimmings but I'm sure that it is a staple in BFC. The pack of printed tags (Canvas Home Basics) was another new item I bought this year because it has lots of food related sentiments and saves me the trouble of stamping my own tags. At this point in time I am looking for shortcuts so I have more time to bake. You may be wondering why I'm showing the Santa monkey 10 bag set. Well, when I totally run out of crafting time, I will resort to pre-made packages like this cute monkey one with the window mouth. I am telling you this just so you will get some for your back up plan, too. LOL! Okay, it's time for me to get back to crafting and baking. Come back for another visit, soon! Who wouldn't want a slab of fudgey sweetness? 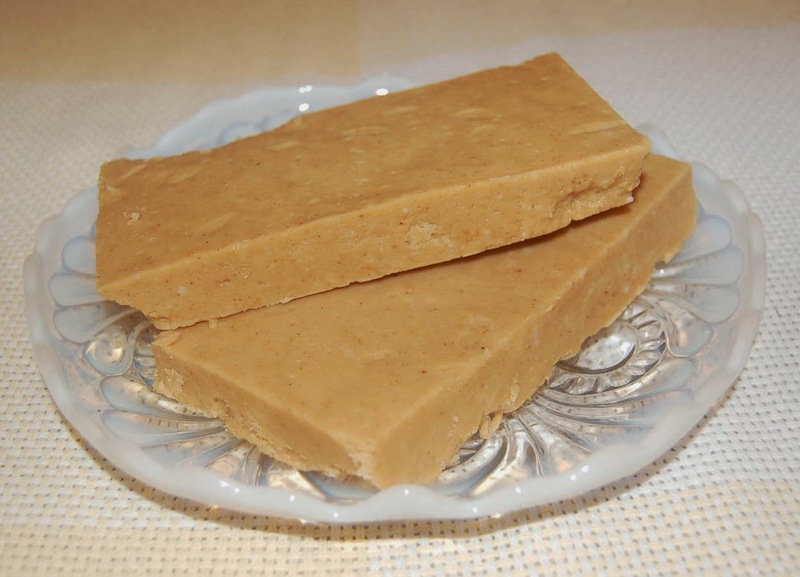 This peanut butter fudge was made from Alton Brown's recipe and is super easy to make. The taste is fabulous, like the inside of a Reese's peanut butter cup. 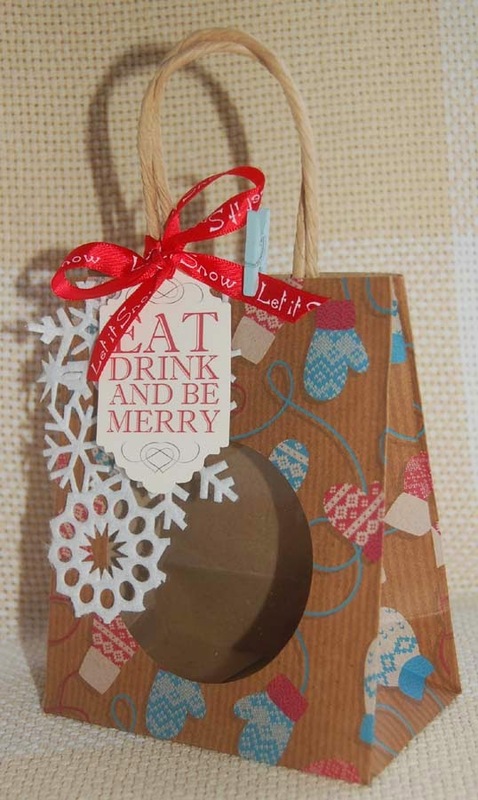 Wrap up a hunk of this fudge in festive holiday packaging and you will have the perfect gift for anyone. I found these sweet containers at Ben Franklin Crafts and I think they will be even sweeter when filled with a block of fudge and tied with a fancy bow. This solves the problem of grab bag, co-worker, and unexpected holiday gifts. Have a stress-free season of gift giving! I had a few more gift card holders to decorate, so I decided to make a scenic one using the Lawn Fawn 'Snow Day' stamp and die sets. When my husband first saw the front of the gift card holder, he said, "Oh, an Easter card?" When I showed him the inside he said, "Rabbits in the snow?' Okay, rabbits are not the traditional Christmas animal, but they do frolic in the snow because it provides good camouflage. 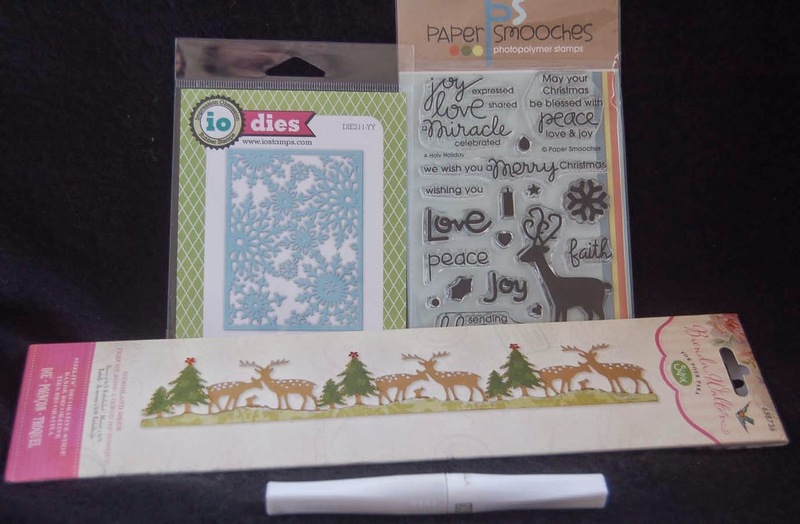 I liked this Lawn Fawn stamp set (from Ben Franklin Crafts) and matching die set because it has lots of images which can be used for other occasions. For example, the 'You Warm My Heart' stamp could be used for Valentine's Day. The sentiments were stamped in gold (Delicata ink pad from BFC) and then heat embossed with gold embossing powder. 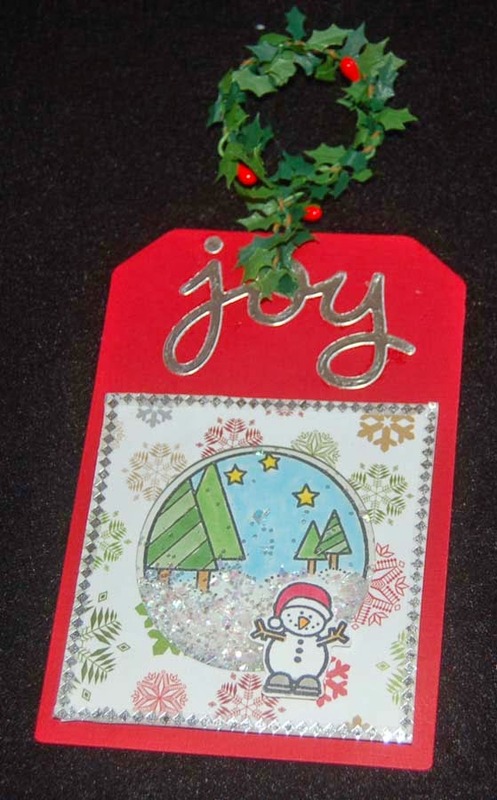 I used a Paper Smooches curved border die to cut the glitter paper in hill shapes but you could cut it freehand. 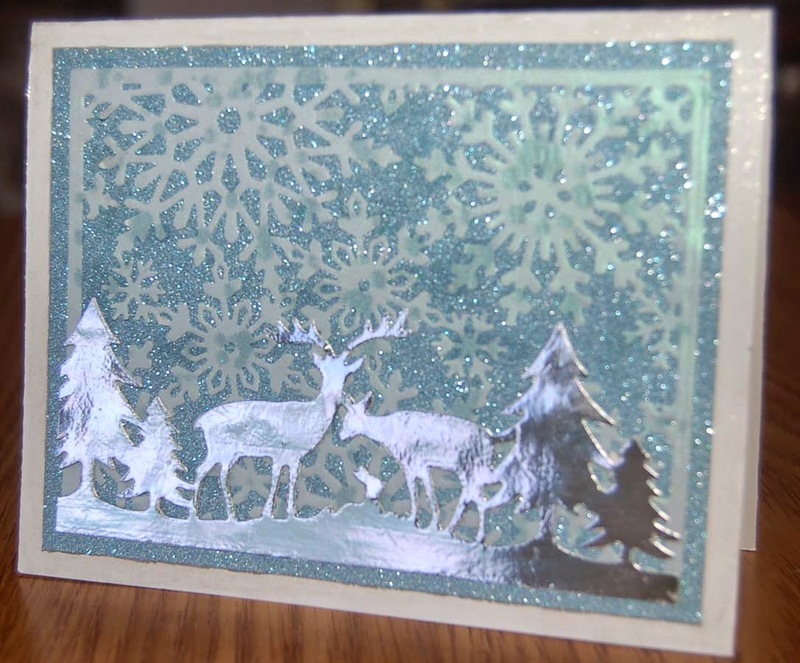 The moon was cut from shimmer paper (DCWV from Ben Franklin Crafts) and has a subtle glow that I really love. To add some interest to the trees, I stamped them in green ink and painted them with a green Wink of Stella pen (available at BFC). The 'snow bunnies' were given fur by gluing on some Martha Stewart white glitter flocking (sold in a set at BFC). I don't know why the blue is so bright in this photo and not the real color that shows in the first photo. In this photo one of the half (I cut it) Velcro dots shows a lot but in normal lighting it barely shows (like the one on the left side). I didn't put the Velcro closure dot in the center because it looked like a planet next to the moon...LOL! You can faintly see the opening (for the gift card) in the stand up part of the holder. 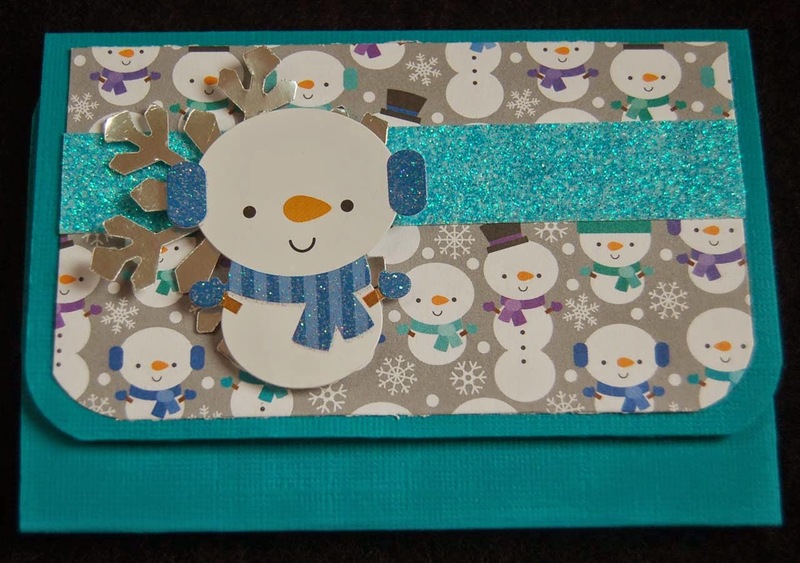 The felt snowflakes are from my stash but I know that I originally bought the pack from BFC. 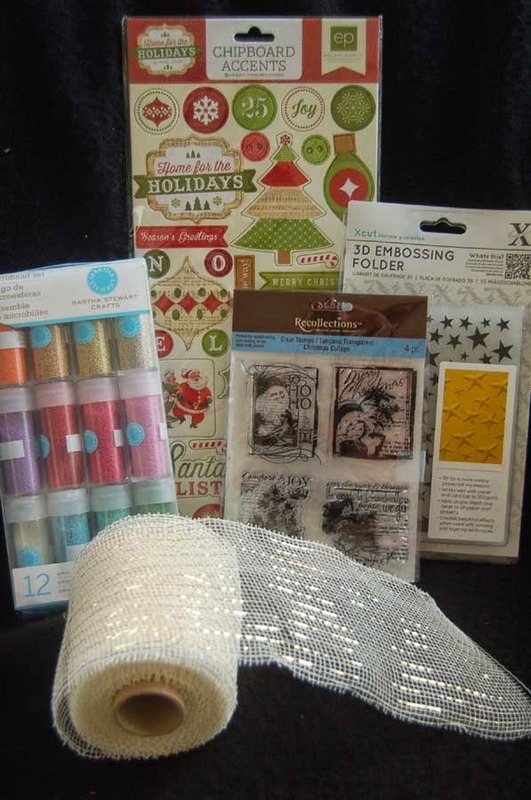 The Doodlebug sequins in a combo of white, silver and clear are perfect for embellishing Xmas projects. Finally, the printed tree 12x12 is a Bella BLVD product which you can find at HM Ben Franklin Crafts along with many other lovely two-sided sheets. 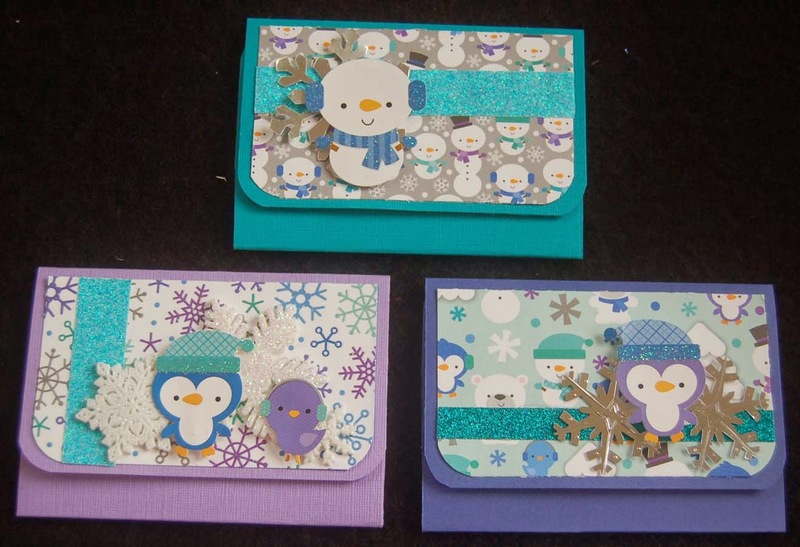 I hope that you will try to make your own gift card holders so your friends and family members will know that even though you had no idea what to get them for Christmas, you did want to give them something homemade from your heart. Hugs and thanks for stopping by! 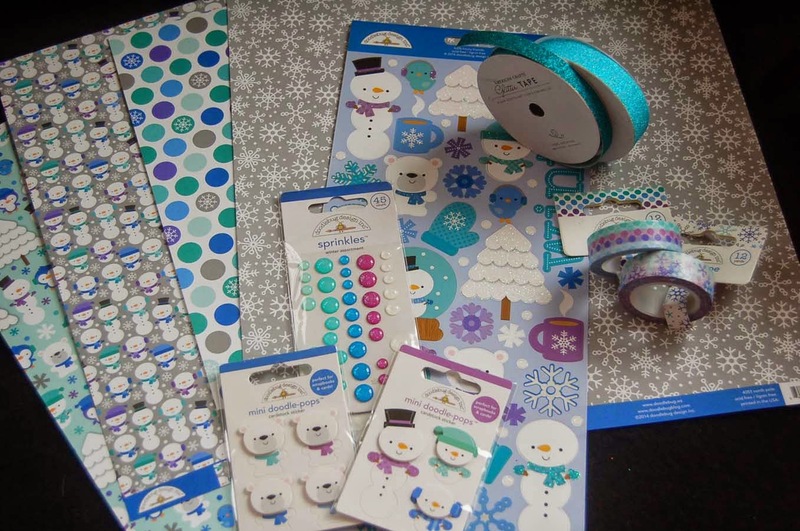 After visiting the Dandelion Design blog site, I decided that I really wanted to get the snowmen set. Happily, I found it at HM Ben Franklin Crafts. The small size makes it perfect for a tag and the tiny images are easily colored. 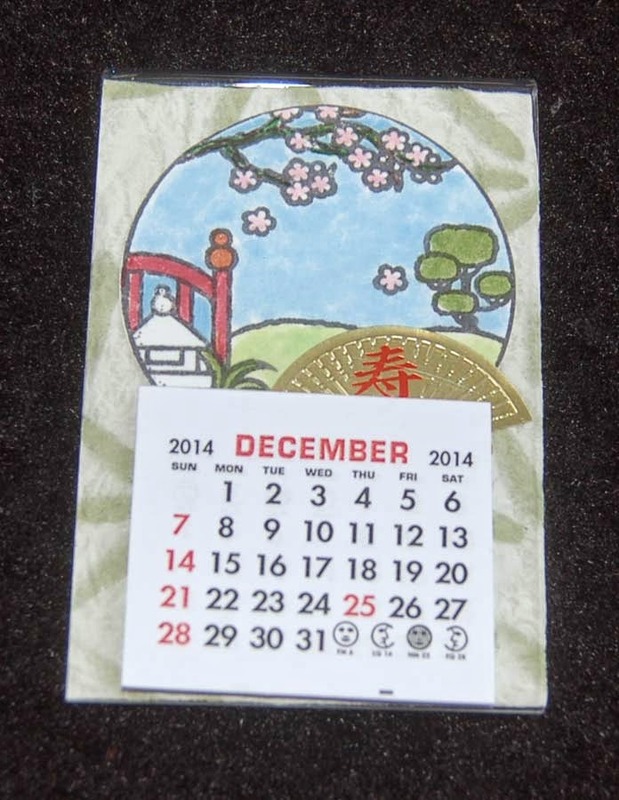 I used a 2" Sizzix circle die to cut the opening in the 3" square of printed card stock and foam sheet. Acetate was used to form the window and WOW glitter plus MS snow were filled in the recess. 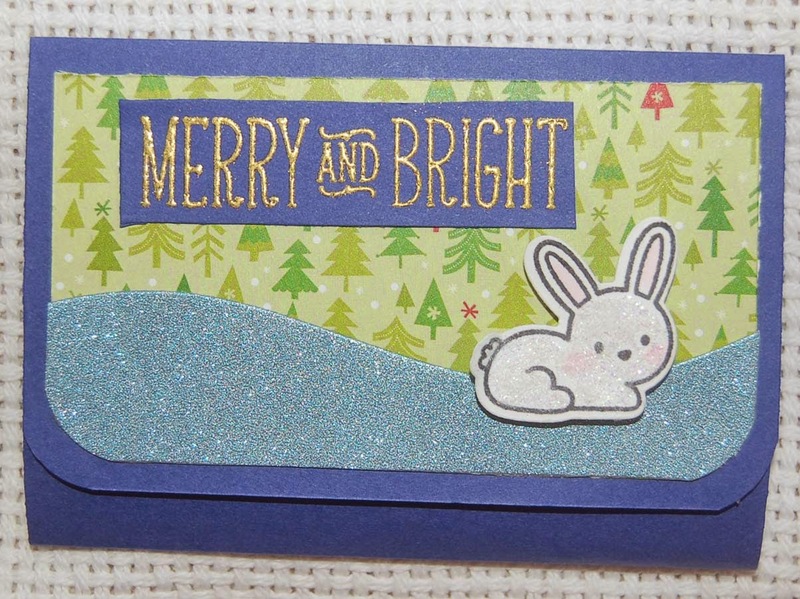 To add extra sparkle to the tags, I die (Lawn Fawn) cut 'Joy' from foil cardstock and added Little B thin foil washi tape to the edges. Oh yes, the tag base was cut with a Little B die from a set. By keeping the shaker element in a simple square and circle, multiple tags can be constructed quickly. Hope you are having a great time creating holiday crafts....I am! 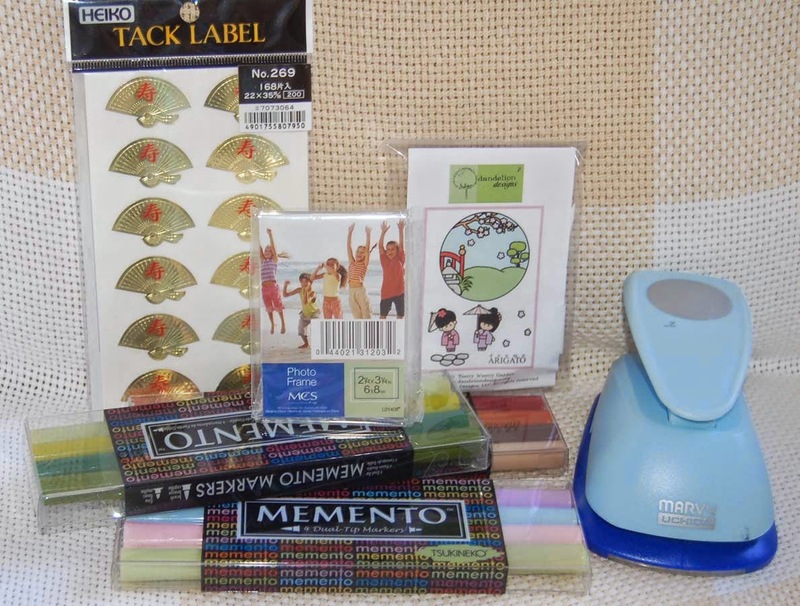 Even though I haven't started creating with these products yet, I thought I would show you some of the cool stuff I found at Celebrations (the Japanese stationery store next to Mapunapuna Ben Franklin Crafts). 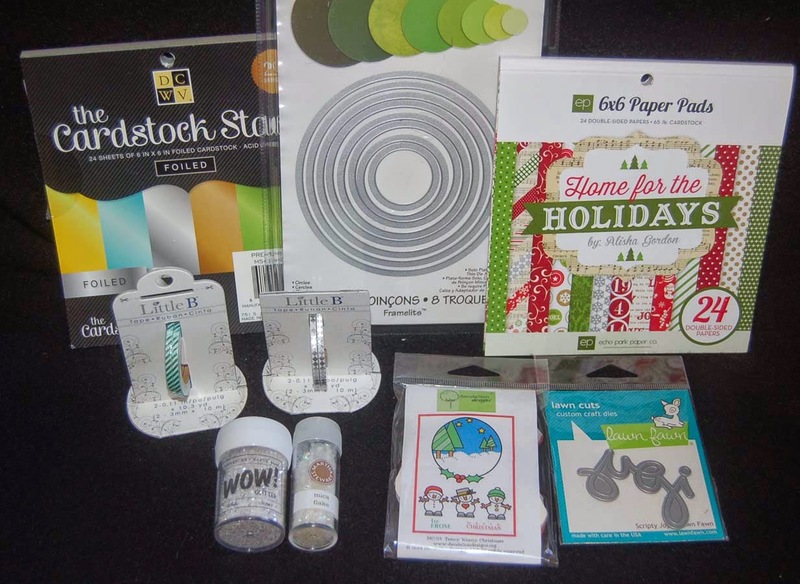 I went in to get some thin holiday ribbons for attaching to tags (center of photo) and not only found pretty shiny and rustic ones but discovered lots of adorable printed tape (to the right of the ribbons) which I plan to use to dress up packages for mailing. 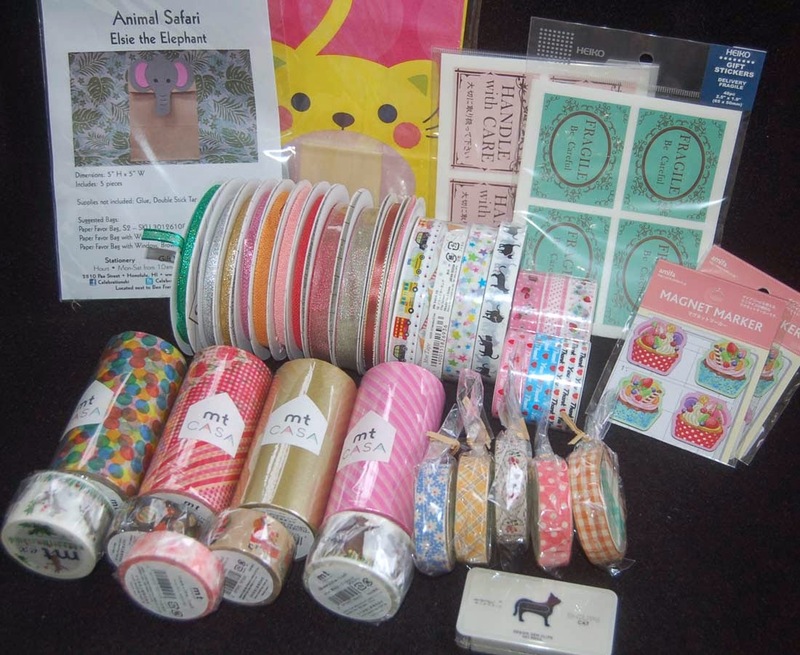 My favorite find at the store were the extra wide washi tapes! I know I will put them to good use in future projects. Below the wide washi tapes are some Christmas, sakura and dancing animal washi tapes that I just couldn't resist. To the right of the washi tapes are fabric tapes that I think will pair well with lace and doilies. In the front is a box of cat paper clips (other animals available) that I can imagine using on a card to attach embellishments or gift cards. 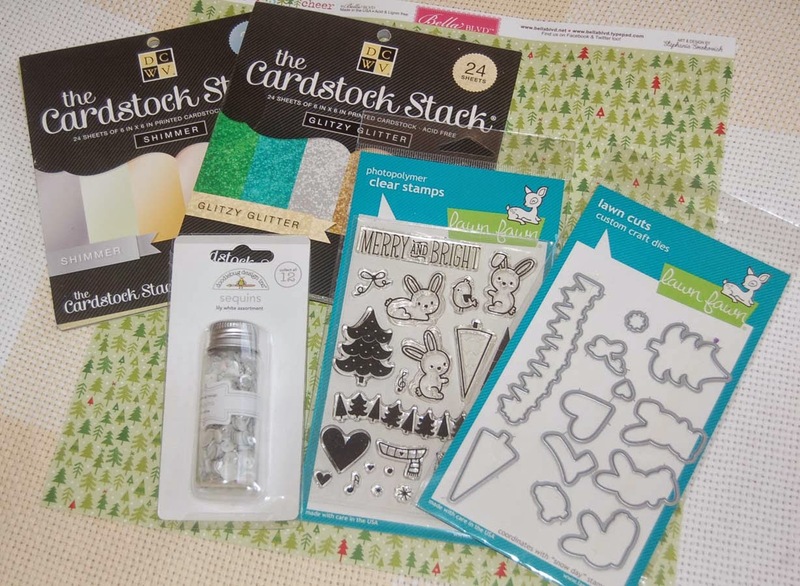 In the back of the photo is a set of package toppers (lots of other animal shapes sold at Celebrations), open mouth cat bags, handle with care/fragile sticker labels and dessert magnets. I also bought a lot of printed wrapping paper sheets....so many to choose from and so reasonably priced. Hope that this post whets your appetite for the novel items that Celebrations sells. Check them out before you start your Christmas wrapping and wrap up your gifts in style! I love to read craft magazines. 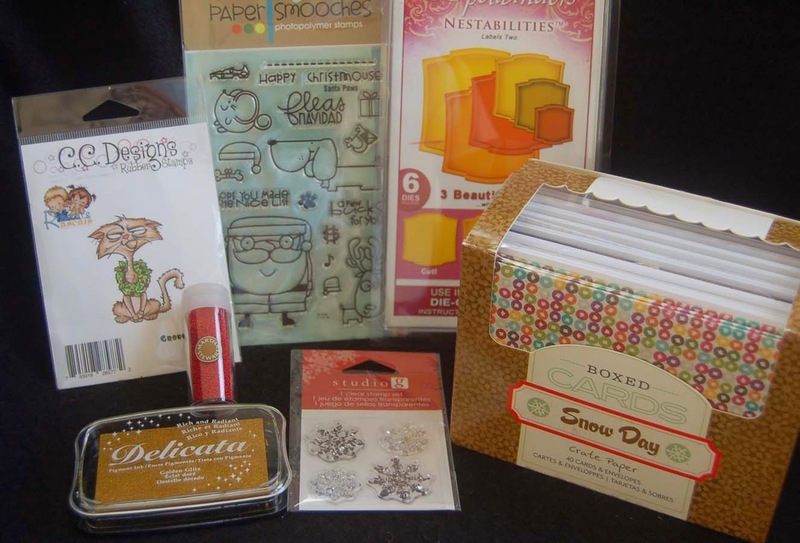 Recently, I was thumbing through the Nov. 2014 issue of CardMaker 'Happy Holidays' issue when I spied an easy and clever gift card holder on page 26. I quickly made a bunch of these in solid colored card stock. 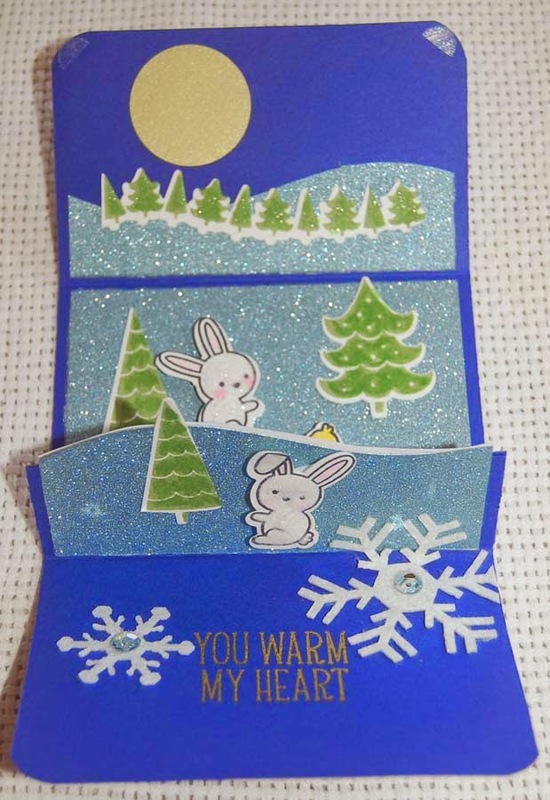 Then the fun began as I started cutting out double sided Doodlebug 'Frosty Friends' card stock (from HM Ben Franklin Crafts) to decorate the inside and outside of the card holders. 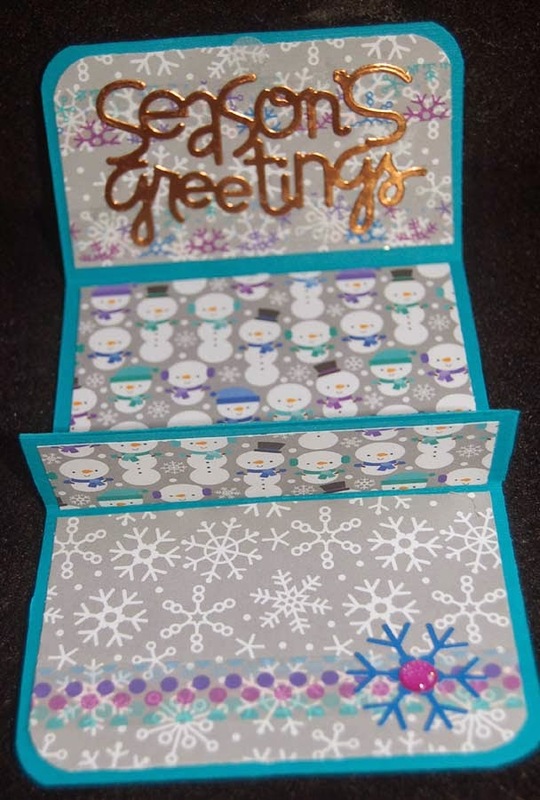 Together with the matching Doodlebug stickers and washi tape plus some American Crafts glitter tape and snowflakes (also from BFC), I was able to create an infinite variety of card holders. The original card holder in the magazine was folded in reverse of mine but I liked having the flap on the outside so the holder looks like a wallet. Also I used mini Velcro tabs (from BFC) to close my gift card holders but the one in the magazine had a decorated band holding it closed. I made all the insides different but this the one that I liked best. I used less colorful DB paper on the top so that the die cut foil words would show better but to add a little needed color I simply applied some DB washi tape. I attached some washi tape to the bottom panel too, but made sure to leave room for a message. 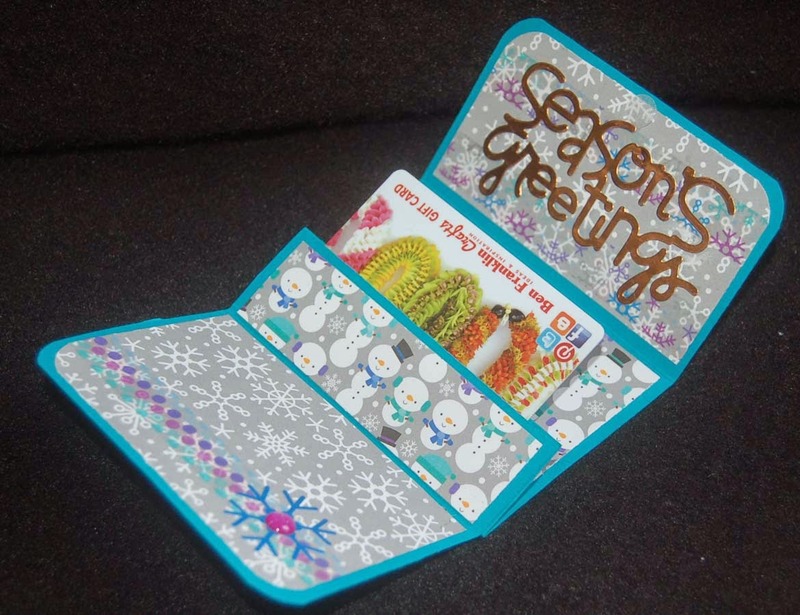 Here is a photo of how the gift card looks when inserted in the holder. The center part actually stands up with the card for a great presentation. I put the card in upside-down so you could see that it was a Ben Franklin Crafts gift card. That reminds me.....it must be time for a giveaway! Read on. Okay drum roll please.... the randomly selected (from my Nov. comments) winner of a $25 Ben Franklin Crafts gift card is.....Annette Allen! (My Clever Creations) ( Annette please send your mailing address to this email (lsakami@aol.com) so I can get the card to you asap. All you have to do to be my next winner is to comment on any of my posts and when I choose the next giveaway month I may select your name from all the comments from that month. 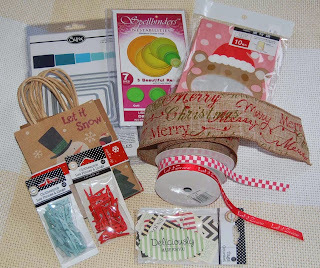 Happy Crafting and leave a comment if you have some time to spare during this busy holiday season. I love hearing from all of you!